The ultimate user-friendly timer fulfills every lab’s timing needs. Displays three different times simultaneously, counts down, and alarms. Also functions as a stopwatch and a time-of-day clock displaying time to the second. Quartz-crystal accuracy is 0.001%. Four rubber feet keep the timer off a wet bench. Three different tests may be run at the same time using the three-line display. Channels may be started individually or simultaneously. 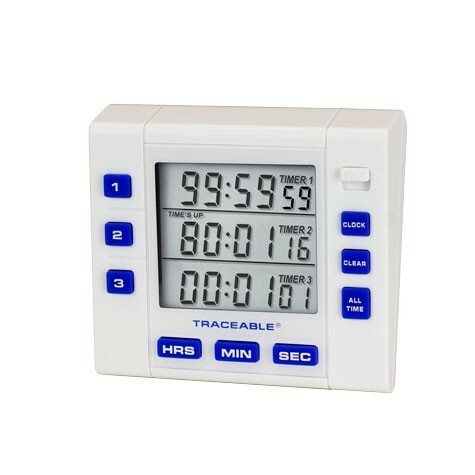 Timer can concurrently signal the duration of incubating, heating, and cooling. Program each channel from 1 second to 99 hours, 59 minutes, and 59 seconds. When zero is reached, an alarm sounds, a TIME’S UP message flashes on the display, and timer begins counting up. Adjustable alarm volume allows setting the timer to high for noisy areas or low for quiet environments. Alarm may be set to silence automatically after 1 minute or to sound continuously until turned off. The continuous setting makes certain that an alarm is never missed. Memories return the display to the previously programmed time at the touch of a key. In the stopwatch mode, the timer counts up from zero. For increased flexibility, the display allows simultaneous up and down timing on different channels. Unlimited number of time-outs may be taken. Traceable® Certificate, ABS chemical resistant plastic case and battery.